Next move on Obamacare? It's up to President Trump. Minutes after House Republicans shelved their bill that was supposed to save the nation's health care, Trump repeated that Obamacare was on the verge of collapse. 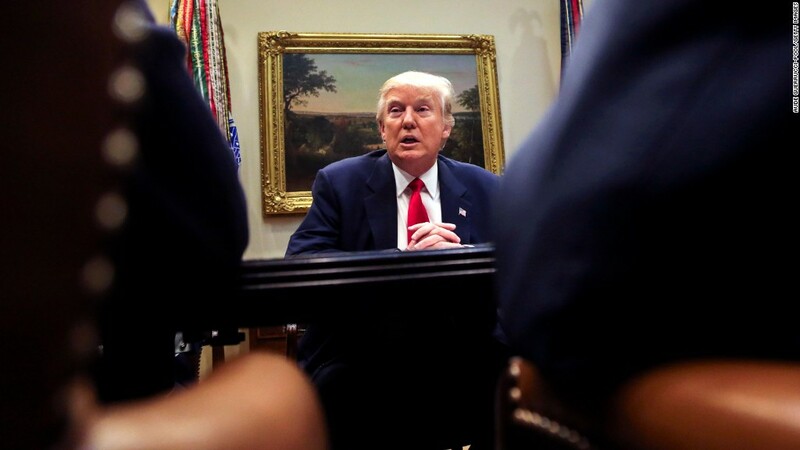 "Bad things are going to happen to Obamacare," said Trump, calling out the large premium increases and insurer defections that plagued the exchanges this year. "There's not much you can do about it. It's not sustainable." While Trump is trying to shift the responsibility to the Democrats, it's his administration that will largely have to decide whether 20 million people who gained coverage under the sweeping 2010 health reform law will remain insured. Are you on Obamacare? Has it helped you or hurt you? Are you concerned it will collapse soon? Are you struggling to pay its high premiums or deductibles? Email me at healthcarestories@turner.com. You could be featured in a story. It's not at all clear that Obamacare is in a death spiral, but there's no question the program is troubled. Insurers have found themselves with sicker and costlier customers than they expected, forcing them to raise rates and exit certain markets. But carriers say it's now largely in the hands of the Trump administration and Republican lawmakers as to whether they will participate next year. Over the past several months, insurers have urged officials to provide clarity on several key measures that they say will help shore up the exchanges. "If Republicans want to stabilize the market, they have the tools to do so," Dr. Mario Molina, chief executive of Molina Healthcare (MOH), which has just under 1 million exchange enrollees in nine states, told CNNMoney. "If they don't act, they can't say Obamacare exploded. They made the decisions that led to people losing their coverage. They can't shift the blame anymore." Insurers must decide in coming weeks whether they'll participate on the exchanges next year. At least one, Humana (HUM), has already said it won't. Molina said he will decide in May. Among the top priorities is having Congress fund the cost-sharing subsidies that reduce the deductibles for millions of low-income enrolleee. Lawmakers have delayed their decision at least until April. Also, insurers want the Department of Health & Human Services to clamp down on special enrollment periods so that people can't sign up when they become sick. And carriers want the agency to continue the Obama administration's efforts to bolster the risk programs that insulate them from costly policyholders. "There's still a lot that can be done for market stability," said Kristine Grow, spokeswoman for America's Health Insurance Plans, a main trade association for insurers. Trump officials have already started taking steps to stabilize the market, which they have had to do to fulfill their pledge not to have millions of people lose coverage as they tried to move to the Republican plan. HHS is already working to tighten enrollment periods and require enrollees to pay any back premiums they owe before signing up again. The agency is also giving insurers a little more latitude in how much their policies must cover in the individual market. This proposed rule, which should be finalized soon, addresses several industry concerns. Also, Health Secretary Tom Price has made it clear he is open to giving states more flexibility in how they administer their exchanges and their Medicaid programs. Asked for a comment about the agency's next steps, an HHS spokeswoman pointed to a recently-created website titled "Providing Relief Right Now for Patients." It lists the measures HHS is taking to address Obamacare -- originally intended to be one of a three-prong effort to overturn the law. "Within what the law allows, HHS is taking action to stabilize the individual and small group insurance markets (the markets most affected by the ACA) so that they work better for everyone," the site reads. At the same time, some of the administration's moves -- and certainly the Republicans' rhetoric -- have damaged Obamacare. One of the first was pulling the Obamcare ads in the final days of open enrollment in January. That marketing effort is crucial to getting people sign up ahead of the deadline. Enforcing the individual mandate, which remains the law of the land since the GOP repeal bill failed, is one of the keys to keeping younger, healthier consumers in the market. The Internal Revenue Service has loosened its oversight slightly, citing Trump's executive order to lift Obamacare's financial burdens on Americans where possible. Whether to step back more on the mandate is up to Trump. "It's a decision that can be traced directly to the White House," said Molina, whose company is one of the few to have prospered in the exchanges.